Scott Heller/Dr Space and his musical collaborators of the Øresund Space Collective return with another psychedelic ripper, 2016's `Visions Of...'. Originating from the same sessions that dark drone `Ode to a Black Hole' and the eclectic `Different Creatures' (one of the best 'SC releases to date) hailed from, it's another set of slowly unfolding spacey jams that also eventually reveals a strong funk influence this time around once it gets going, making for a unique and fresh release from the players. The near-forty two minute title-track barely slows down for even a second, remaining high-energy and unrelenting almost the entire time! It holds plenty of fuzzy distortion, thick murmuring bass ruminations, sparkling electric piano and fizzing synth trills, with much attention placed on the slow burn but dominating electric guitar and fiery drumming, although sprightly violin and pedal-steel guitar also weave dreamily throughout the second half. `Visions Of...' lightly echoes the classic late Sixties/early Seventies live Pink Floyd performances in several spots, and along with some brief scratchy reggae-flecked moments, it makes for a great example of the sort of music the ØSC musicians frequently deliver so well. The liner notes of the album mention Miles Davis' `On the Corner' as an inspiration, and sure enough `Above the Corner' is a Seventies flavoured infectious groover of sly funky guitars, slithering liquid bass and shimmering organ! Ambient rising/falling synths wash over droning eastern-flavoured guitar effects and hypnotic African drums slowly build in stature and danger in `Piece of Seven', and `Around the Corner' returns to gurgling funky bass and electric piano trickles over lovely floating synth wisps, with the piece really cooking as it picks up in tempo and races towards the finish with an endless blazing guitar solo, chunky grumbling bass and fierce drumming. On this, their twenty-third release to date, the Øresund Space Collective continue their superb run of recent works, and this one has everything you could want from the band - sh*t-hot playing, cool grooves and plenty of deep-space environments, and it also reveals those surprising little flavours that make each ØSC release stand apart from the last. The `band' won't be performing as much in 2017, so it makes these releases even more vital and special, a must for lovers of jammy space-music and improvised psych-rock. 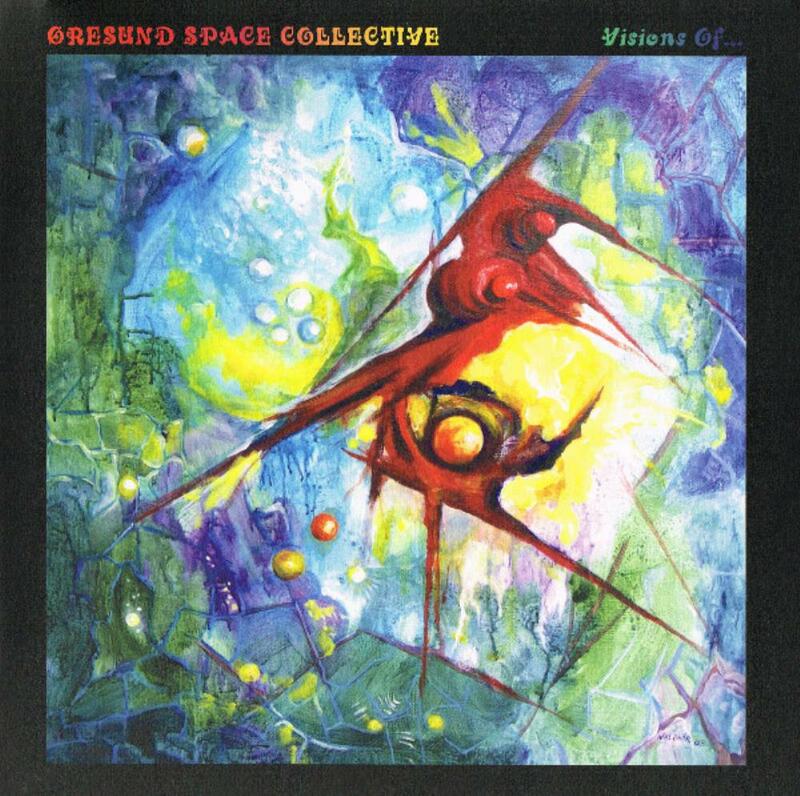 Post a review of ØRESUND SPACE COLLECTIVE "Visions Of..."